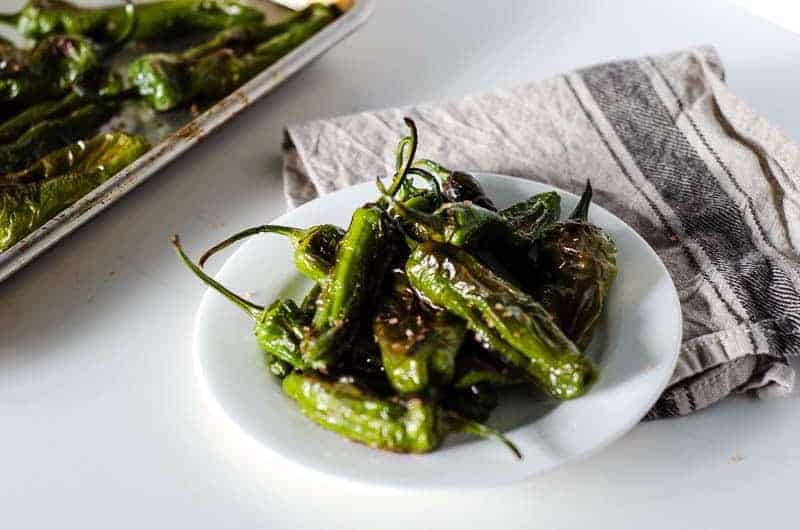 This recipe for roasted shishito peppers takes just five minutes to put together and makes the perfect appetizer or side dish. Friends, meet the shishito pepper. These mild, sweet, and delicate peppers that originate from Japan are easy to make and delicious to eat. If you’ve never experienced these lovelies before, you’re in for a treat. These little Japanese beauties are the best little delicious bites of heaven that you’ve never heard of. Once roasted, you’ll find yourself eating them like they’re popcorn. 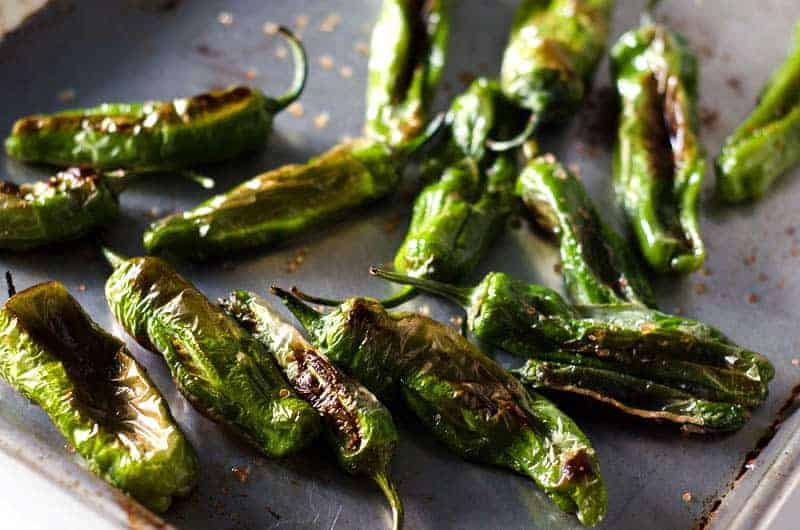 Shishitos are a small and slender thin-walled pepper that originates from East Asia. The name refers to the fact that the tip of the chili pepper (唐辛子 tōgarashi) looks like the head of a lion (獅子 shishi); in Japanese it is often abbreviated as shishitō. Check your local farmer’s market, and keep an eye in the grocery store seasonally. Trader Joe’s often carries them as well. If you don’t have any luck, try growing your own! They’re easy and low maintenance. How do I know when to pick my shishito peppers? If you leave them on the plant long enough, they’ll turn red. I don’t recommend waiting this long. Pick them when they’re a bright green color for the most tender, flavorful crop. 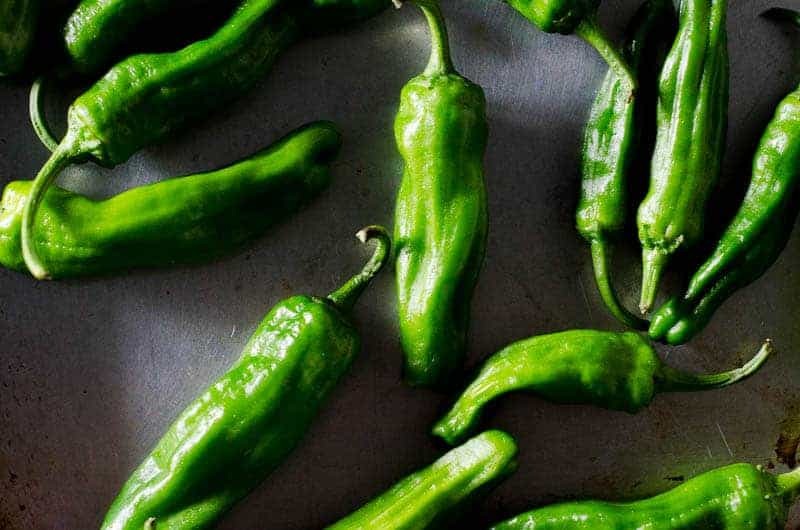 The first time we saw shishito peppers at the farmer’s market, we had no idea what they were. The girl at the stand told us to take them home, roast them, and eat them, so we did. And we’ve never looked back. We grew a bunch of them last summer. Ours were never this large, but we got a few good harvests. I can tell you if you leave shishito peppers on the plant for too long, they will turn yellow and then red. Pick them when they’re green – they’re at their best! This was the last box at our farmer’s market on Saturday and I had to share them with you. They won’t wait. Just look how perfect they are! If you can’t find them at your farmer’s market, or you don’t have one, check Trader Joe’s if you have one in your area. They sell them in a bag in the refrigerated produce section occasionally. Every once in awhile (the interwebs tells me 1 in 10, but I think that’s a gross overestimate, as I’ve eaten my fair share of shishito peppers and only encountered this a few times) you’ll get a hot one. Hot like, “mouth on fire, where is the water, give me all the bread you have” hot. Anyway, if you see shishito peppers at your local farm stand, don’t shy away. They make a perfect appetizer or a great side to a steak dinner. Once roasted, you literally just pick the pepper up by the stem, pop the whole thing in your mouth, and bite it off the stem. This recipe keeps it simple – like, really simple. You can jazz them up any number of ways: add sesame seeds or other spices, mix up the oil you’re using. You can also cook them different ways: some people like to sauté them in a cast iron skillet over high heat to get them blistered. I’ve also served them with a creamy dipping sauce – my mayo recipe makes a great one, with a few spices and some broth to thin it out. You could even just dip them in homemade ranch. With shishito peppers as pretty as these, though, I prefer the basics – an oil toss, a quick roast, and a sprinkle of salt. It’s really all they need. Here’s literally all I did with these – I tossed them in some avocado oil to coat them, gave them a sprinkle of pink Hawaiian sea salt (I know, I’m so fancy), and roasted them on my all time favorite baking sheet for five minutes. When you pull these out of the oven, they’ll be puffy, and look almost white. But about 10 seconds after you pull them out, they will deflate like little popped balloons and will become the tender bits of deliciousness you see here. Wikipedia says that you can poke a hole in the pepper to keep the hot air from bursting it. However, I think them inflating and deflating is part of the fun. They’re soft and tender when you eat them. Feel free to poke holes in your shishito peppers if you like. To each his own. Serve them right out of the oven when they’re hot – once they’re roasted and get refrigerated, it’s hard to get that fresh taste back! Don’t over-roast them. They cook up fast, so keep an eye on them! One in ten can be hot and spicy. Just be prepared! Once roasted, they don’t save or reheat well – they get mushy. Only cook what you’re going to eat. P.S. Want to know a secret? I taught myself how to use the remote control for my camera yesterday, which is how I got that shot of me pouring oil over the peppers! I’ve had the remote for a couple of months and just been too intimidated to figure out how to work it. Turns out its incredibly easy, and my fear of the struggle was bigger than the actual struggle itself. Isn’t that always the way? Did you make this recipe? Leave a star rating below! 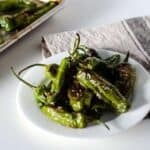 A quick and easy way to roast Japanese shishito peppers for the perfect appetizer or snack. Place the shishito peppers in a large mixing bowl. 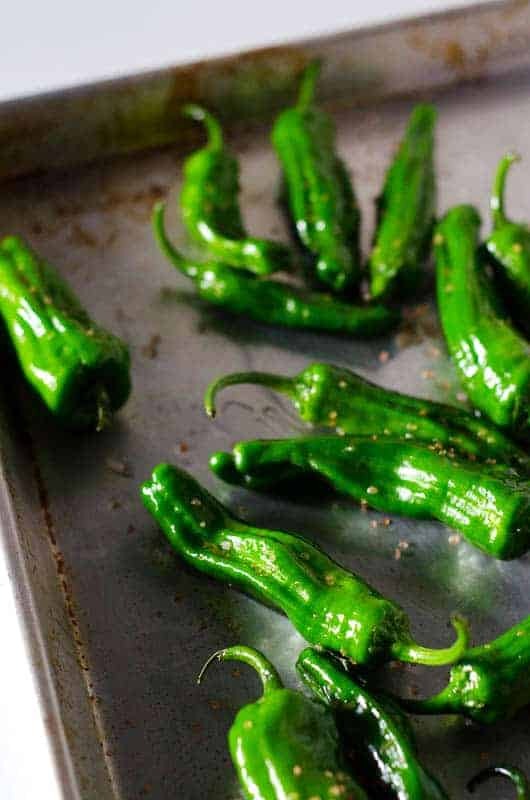 Dump the peppers out onto a baking sheet. Sprinkle with a generous pinch of sea salt. Roast in the oven for 5-7 minutes, or until peppers are blistered and puffy. 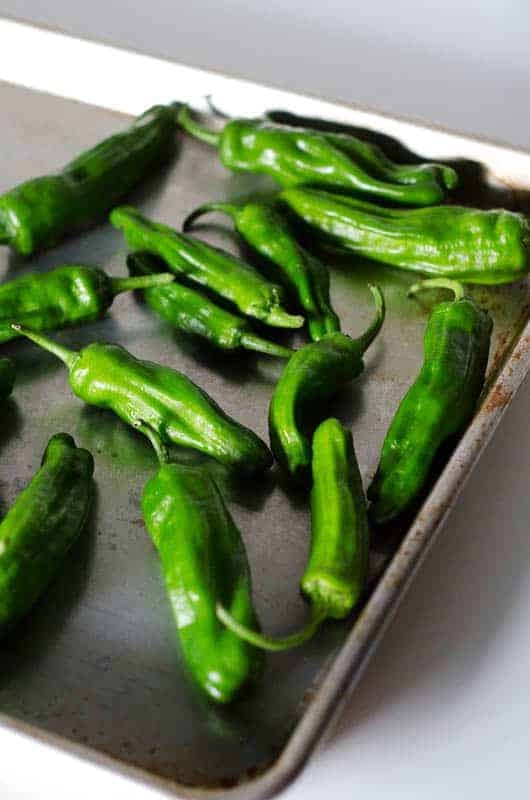 Remove from the oven, watch the magic peppers deflate, and serve immediately! Feeling saucy? 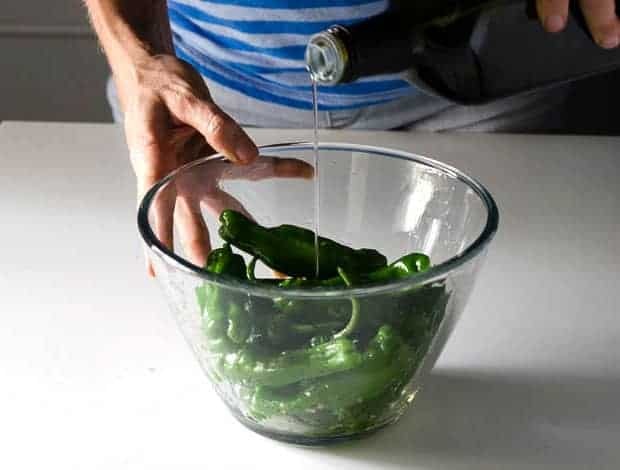 Make a dip for your peppers. Serve them with some ranch, or use mayo as a base for a tasty sauce. Get creative! These don't store well - they're best eaten right after cooking. Cook only what you plan on eating. 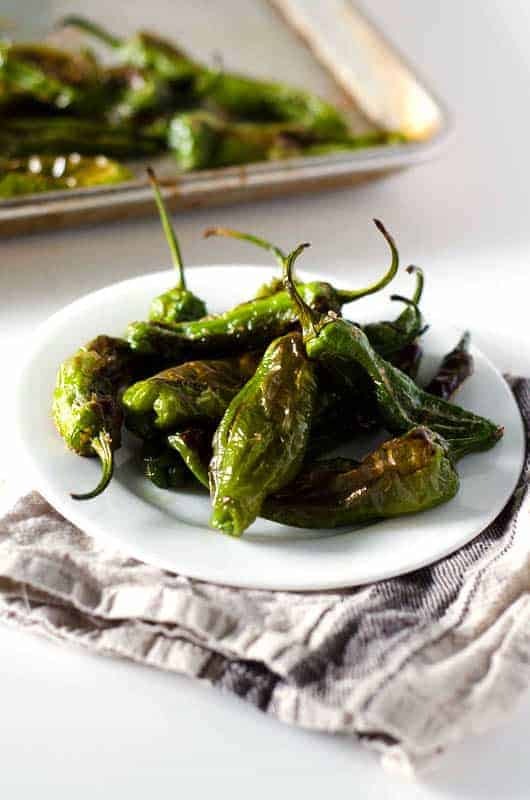 If you’ve tried this roasted shishito pepper recipe or any other of my recipes on the blog, I want to see! Tag me on social media and follow along for more delicious recipes. You can find me on Facebook, Instagram and Pinterest to see more delicious food and what I’m getting into.